← Is electromagnetism one of the causes of CCD? If hardwired connections are not available in the school then minimize use of the cloud and instead use applications that are pre- downloaded on devices. Download and install files for curriculum prior to students’ use eliminating need for Wi-Fi. Store laptop carts outside of the classroom and avoid recharging near students/staff. Instead of virtual reality “field trips” show movies on a large screen to class. Regularly scheduled parent education on the safer use of technology that includes how to minimize health risks of cell phones, screens and wireless digital devices with hands on workshops for how to hardwire home electronics and create a low EMF computer workstation. Regular discussion forums on parenting strategies for the challenging situations they face in regards to technology and their children. Policies for cell phone & digital device use in classrooms that includes medical recommendations for children’s health and safety related to eyes/posture/addiction/radiation. Policy that allows for a convenient way for students to communicate with parents in regards to last minute scheduling issues such as corded phones/computer/bulletin board or convenient, accessible ways to get messages to/from students. 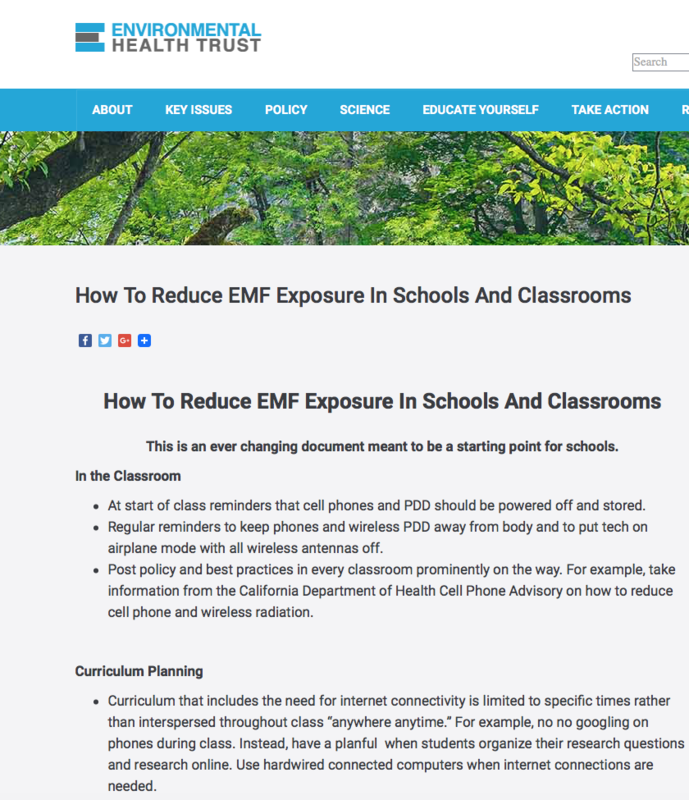 Technology Curriculum: Health curriculum that includes information on why and how to reduce exposure to wireless radiation including ho to disable wireless on their personal devices step by step. Environmental science curriculum that review current and historical regulatory policies on EMFs, and international approaches. Wired rather than wireless LAN networks in schools. Only use computers and tablets that can be Ethernet connected and have the ability to disable all wireless antennas. Convenient computer stations and ethernet posts placed throughout school for internet access. Hard wire all technology devices. This includes fixtures such as printers, projectors and boards in addition to computer accessories such as speakers, mouse and keyboard. Only purchase technology that can be hardwire with all wireless antennas turned off. Operate laptops and tablets only in battery mode and not when plugged in. Corded phones in every room and for students use in common areas to minimize need for cell phone. Hardwire security systems as much as possible. Hardwire microphones, speakers and tech in auditoriums. Do not use fluorescent lights. No microwaves in classrooms and ensure all microwaves are checked for leaks are not older with damaged seams. Teach students and staff to keep a distance from microwaves. Replace smart meter with analogue meter. The wiring in all school rooms shall be compliant with US National Electrical Code in the local jurisdiction, and applicable state electrical code. An electrician should do an evaluation to ensure school rooms are free of the following common wiring errors. construction and 2 mG (200 nT) in existing school modernizations. Classrooms should not be above electrical panels or electronics that generate high EMFs. Cell towers should not be located on or near schools. What are examples of best practices for schools? Doctors recommend a fully wired low EMF classroom. Please read letters to Petaluma Public Schools: Dr. Carpenter, Dr. Anthony Miller, Dr. Martha Herbert, Dr. Lennart Hardell. For a full list of doctor letters to schools on this issue please see this webpage that has compiled letters.